On Monday retired Navy SEAL Don Shipley shared Nathan Phillips’ (a/k/a Nathan Stanard) DD-214. Retired Navy SEAL Don Shipley, who is very well known for exposing false claims of military service acquired the DD-214 through an FOIA request. According to Shipley and the DD-214, Phillips enlisted under Nathaniel Richard Stanard, an “adopted” name. But his birth name was Nathaniel Phillips. He enlisted in the Marine Corps Reserves, serving from 1972 to 1976. Phillips never left the United States during his service in Lincoln, NE, and El Toro, CA, and was discharged as a private. “He enlisted in the Marine Corps in Topeka Kansas — there’s a hot spot — and he was separated from the Marine Corps in El Toro, California in 1976,” Shipley said. 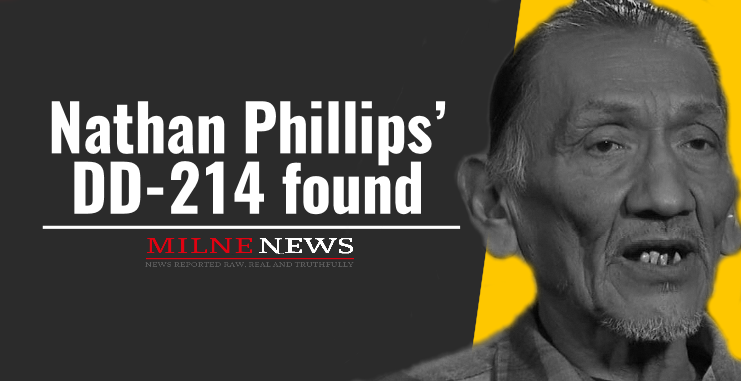 Phillips was then later moved to a marine base in El Toro, California where he “went AWOL a few times,” according to Shipley. Shipley said he suspects Natha Phillips never even served as a “recon ranger” as he has claimed. This simply isn’t true. Even the Washington Post had to admit he never served in Vietnam.